Here at Themis Web Technologies, we develop custom websites and tools that make our clients ideas come to life. Our ability to deliver and quality of work has drawn attention from third-party ratings and reviews firm, Clutch.co. Clutch conducts research on B2B service providers in the tech space and evaluates companies based on their market presence, industry experience, and most importantly client feedback. Their team has already interviewed over nine of our clients so far about their experience working with us. This has resulted in us receiving an almost perfect five-star rating across factors including quality, cost, and ability to meet deadlines. 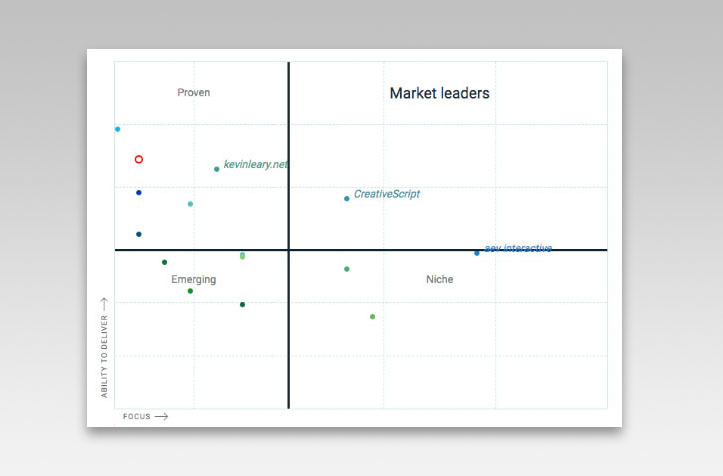 The Leader’s Matrix above published by Clutch highlights our spot as a leader and our firm’s ability to deliver. We want to take a moment to share the feedback we’ve received from clients recently as part of our inclusion on the platform. They have explained why they chose to work with us and what has been the most rewarding part about our partnership with them. They knew our objectives and came up with creative solutions to overcome any problems. 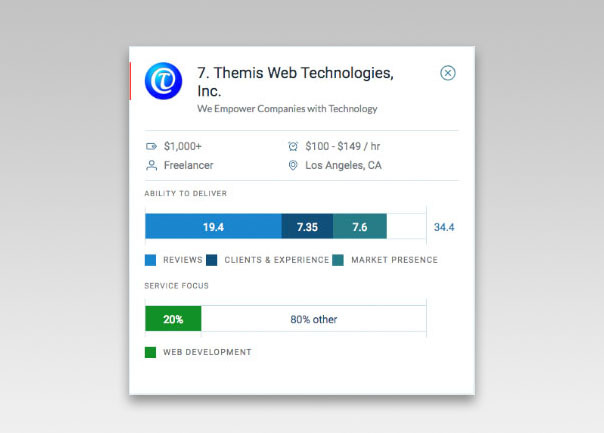 Our yield increased by 20% after working with Themis Web Technologies. The accuracy of our order and billing process has improved 100%. Themis is able to troubleshoot next to anything and build battleship-strong frameworks and systems. 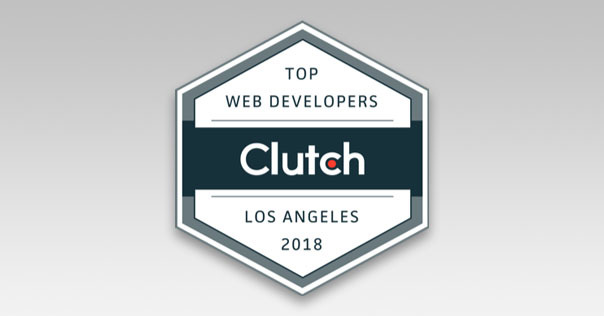 With such a short time on the reviews platform, Clutch has already highlighted us as one of the leading freelance web developers. Their sister company, the Manifest, has also featured us as one of the highest-performing web developers in LA in their new research. The Manifest provides insights on business news and industry lists and we’re thrilled to receive acclaim on both platforms. 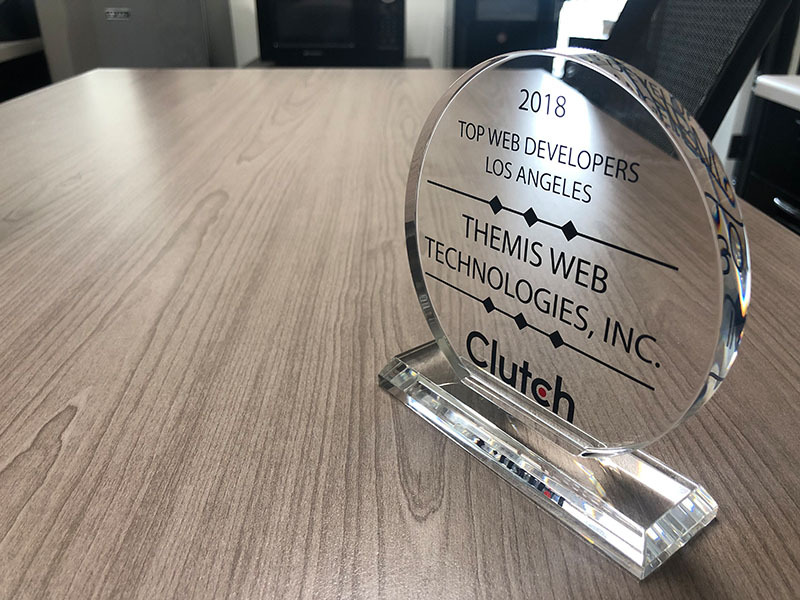 Keeping up with the latest trends in web development can be tricky, however, we are glad to have received recognition as a leader. We look forward to hearing more about what our clients have to say about working with us and can’t wait to see what the rest of 2018 has in store for us!